Poor sanitation is estimated to cause 280,000 deaths per year worldwide, despite of the existence of simple, effective solutions. While governments and major development institutions have dedicated substantial resources and attention to improving sanitation in developing countries, there is little rigorous evidence on how best to increase sanitation coverage. This evaluation in Bangladesh measured the impact of different approaches designed to increase latrine coverage on actual latrine coverage, investment in hygienic latrines, and the prevalence of open defecation. One billion people, or about 15 percent of the world’s population, currently practice open defecation, and another 1.5 billion do not have access to a hygienic latrine or toilet. In spite of the existence of simple, effective solutions, such as pour-flush latrines, poor sanitation is estimated to cause 280,000 deaths per year, and may also contribute to serious long-term health conditions. Given the scope of the problem, governments and major development institutions have devoted substantial resources to improving sanitation in developing countries. However, significant disagreement remains over how best to increase sanitation coverage. Is it more effective to focus on demand generation through information campaigns and behavior change programs, or should governments focus on directly providing toilets to schools or households? Or is it better to subsidize private investment in sanitation? Do subsidies hurt intrinsic motivation? Researchers investigated these questions in Bangladesh. This research was conducted in relatively dense rural areas of Tanore district in northwest Bangladesh, the poorest region of the country. Although sanitation coverage has increased dramatically in rural Bangladesh in recent decades, progress in Tanore has been slower. Prior to the start of the study, 31 percent of households reported that they either lacked a latrine or used an unimproved latrine. Only 50 percent had regular access to an improved sanitation facility, defined as a toilet or latrine that separates human excreta from human contact. 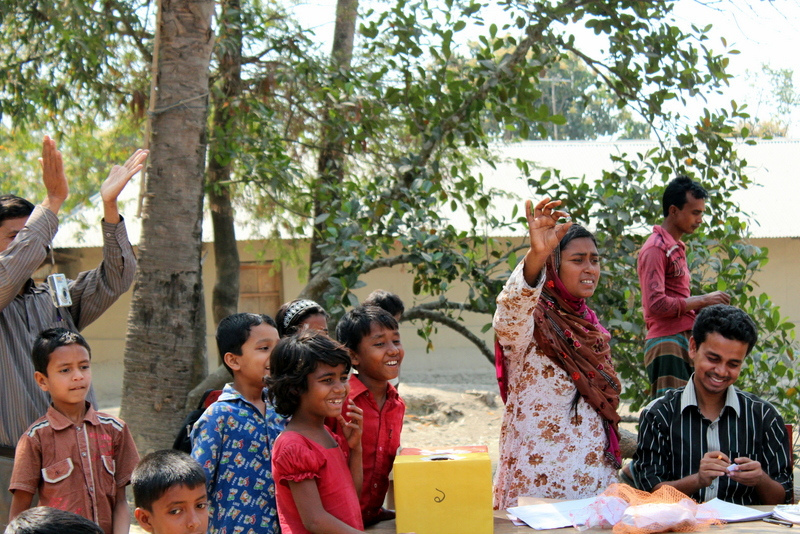 Researchers partnered with WaterAid Bangladesh and Village Education Resource Center to measure the impact of different policies designed to increase community-level latrine coverage on actual latrine coverage, investment in hygienic latrines, and the prevalence of open defecation. This research also aimed to provide insight into the household- and community-level behavioral mechanisms driving any effects. 2) LPP combined with subsidies – Communities were invited to participate in LPP and households were randomly selected via a public lottery to receive discount vouchers for the purchase of hygienic latrines. The vouchers provided a 75 percent discount on any of three available models of latrine, priced (after subsidy) US$5.5, US$6.5 and US$12. Households were responsible for delivery and installation costs of US$7-10. The richest 25 percent of households were not eligible for vouchers. 3) Information and technical support – “Latrine Sales Agents” were hired and trained from these communities and linked to local masons that built latrines. The agents acted as a resource for community members and also offered technical support for latrine installation. Adoption of latrines: Community motivation alone (LPP only) did not significantly increase adoption of hygienic latrines or reduce open defection relative to the comparison group. Providing information and technical support to community members also had no impact on adoption of latrines or open defecation. However, LPP combined with the subsidy had substantial effects, increasing latrine coverage by 22 percentage points among subsidized households and 8.5 percentage points among their unsubsidized neighbors, for an average village increase of 29-36 percent (14-15 percentage point), relative to villages where no subsidies were offered. Open defecation: Community motivation (LPP-only) did not significantly reduce open defection, nor did information and technical support. However, adding subsidies to LPP reduced open defection rates by 9 percentage points among adults in villages that received subsidies (including households that did not receive subsidies), representing a 22 percent reduction relative to the comparison group. Social multipliers: A household was more likely to use the subsidy voucher to invest in a latrine if a larger share of their neighbors also received vouchers. A voucher winner in a neighborhood with medium coverage was 7 percentage points more likely to own a hygienic latrine than a voucher winner in a low coverage neighborhood, and 21 percentage points more likely to own a hygienic latrine relative to households in LPP-only neighborhoods. There was no detectable difference in hygienic latrine ownership between winners in neighborhoods with medium and high coverage. Overall, these results are consistent with a growing body of research showing price is a primary barrier to adoption of health products. The results counter a commonly held belief that community-based motivation is the most effective way to move households away from open defection and toward basic latrines. Finally, this study presents evidence of the importance of social influence, and the possibility of a virtuous cycle where adoption of improved latrines spurs further adoption. Guiteras, Raymond, James Levinsohn, and Ahmed Mushfiq Mobarak. 2015. “Encouraging Sanitation Investment in the Developing World: A Cluster-Randomized Trial.” Science. Published online April 16, 2015.